I don’t know about you, but I have a huge drawer of makeup that I sift through everyday to find the perfect shades to match that day’s outfit. Not only is it time-consuming, I also started realizing that I’ve had some of this makeup for going on 1o years now (gross!). So, I just did some major purging of the makeup drawer to refresh and simplify my morning beautification routine. I started looking for all-in-one kits that have everything from eyeshadows and lip colors to bronzers and blush. 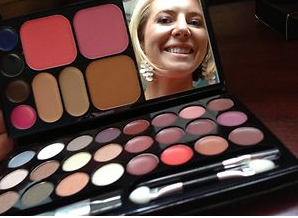 That’s how I came across Skinn Cosmetics’ All-In-One Palette Of Perfection: Face Forward. It’s appropriately named because it truly is perfection. It’s encased by “mock-croc” patent leather, so it’s super chic and all my concealer, blush, bronzer, eyeliner, eyeshadow, lip color and lip gloss is all wrapped up in this elegant little compact… much better than an entire drawer full of old makeup, right? The super concentrated concealer provides excellent coverage, able to hide the most stubborn of blemishes and discolorations. Two blush hues give you the perfect splash of color for day and a more dramatic cheek for the evening. The bronzer provides the perfect touch of warmth for a glowing and radiant complexion. Three cream eyeliners create elegantly defined lines for that soft, sultry smokey look. Twelve Luxe Premier eyeshadows deliver rich color and anti-aging actives that may be worn without fear of developing crepe eyelids. Lips will look their fullest with twelve of the latest lip colors packed with collagen-boosting ingredients and Vitamin E and aloe. What you’ll get: supple and luscious lips. To finish, the palette contains the sold-out Million Dollar Smile lip gloss. Complete with a blu-ray pigment that makes teeth appear whiter, the gloss can be worn alone or on top of any of the lip colors. 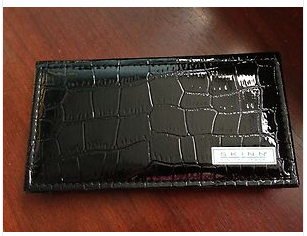 This retails for $42.50 and just became available online at skinn.com. Since it just launched, it’s their “spotlight” product of the month and you can get it for the spotlight price of $24.50! Winning!